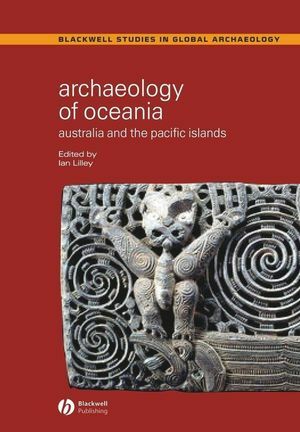 This book is a state-of-the-art introduction to the archaeology of Oceania, covering both Australia and the Pacific Islands. Ian Lilley is Reader in Aboriginal and Torres Strait Islander Studies at the University of Queensland. He is a past President of the Australian Archaeological Association. Lilley currently conducts field research in Torres Strait and New Caledonia, and his recent publications include Le Pacifique de 5000 à 2000 BP: Suppléments à l’histoire d’une colonisation (with Jean-Christophe Galipaud, 1999), Native Title and the Transformation of Archaeology in the Postcolonial World (2000), and Histories of Old Ages: Essays in Honour of Rhys Jones (with Atholl Anderson and Sue O’Connor, 2001). 1. Archaeology in Oceania: Themes and Issues. (Ian Lilley). 2. Revisiting the Past: Changing Interpretations of Pleistocene Settlement Subsistence and Demography in Northern Australia. (Sue O’Connor and Peter Veth). 3. Archaeology and the Dreaming: Towards an Archaeology of Ontology. (Bruno David). 4. Blunt and to the Point: Changing Technological Strategies in Holocene Australia. (Peter Hiscock). 5. Rock Art and Social Identity: A Comparison of Holocene Graphic Systems in Arid and Fertile Environments. (Jo McDonald and Peter Veth). 6. Closing the Distance: Interpreting Cross-cultural Engagements through Indigenous Rock Art. (Anne Clarke and Ursula Frederick). 7. Archaeology in Melanesia: A Case Study from the Western Province of the Solomon Islands. (Richard Walter and Peter Sheppard). 8. Envisaging Early Agriculture in the Highlands of New Guinea. (Tim Denham). 9. Late Pleistocene Complexities in the Bismarck Archipelago. (Matthew Leavesley). 10. Life Before Lapita: New Developments in Melanesia’s Long-term History. (Christina Pavlides). 11. The First Millennium BC in Remote Oceania: An Alternative Perspective on Lapita. (Jean-Christophe Galipaud). 12. Ethnoarchaeology in Polynesia. (Eric Conte). 13. The Formation of Hawaiian Territories: (Thegn Ladefoged and Michael Graves). 14. Ritual and Domestic Architecture, Sacred Places, and Images: Archaeology in the Marquesas Archipelago, French Polynesia. (Sidsel Millerstrom). 15. The Archaeology of the Conical Clan in Micronesia. (Paul Rainbird). 16. What is Archaeology for in the Pacific? History and Politics in New Caledonia. (Christophe Sand, Jacques Bole and André Ouetcho). 17. Levuka, Fiji: A Case Study in Pacific Islands Heritage Management. (Anita Smith). A Few Words about Archaeology in French Polynesia. (Mickaelle-Hinanui Cauchois). Shaking the Pillars. (Mark Dugay-Grist). What is the Future of Our Past? Papua New Guineans and Cultural Heritage. (Herman Mandui). "50,000 years of Australian and Pacific archaeology masterfully surveyed by a new generation of scholars - this is a 'must have' for every archaeologist working in the region." "This new collection usefully focuses attention on recent developments in the archaeology of Australia and the Pacific and includes particularly thoughtful perspectives on the politics of archaeology in the region." "This book certainly provides a good introduction to current research and issues in the region … Key research questions are illuminated by current research with a clear, accessible style."